Even though it may seem deceptively straightforward, all the planning, campaigning, advertising, and networking that our group did for the Anti-Hunger Games took up almost all of our free time during the fall semester. But it was completely worth it! After spending a few weeks on campus, all five of us had come to the conclusion that there was so much to do and so much to discover in the university that it would be very easy for students to never get to know the actual State College community. So from the start, we knew that the "AHG" would be different from any other drive because we would personally meet, or collect information from, both the donors and the recipients of the food and try to build a connection between them. "To establish a tradition of providing for underprivileged families in State College by engaging South Halls residents in a food drive competition during the Thanksgiving season." To accomplish this, we compiled a list of State College families who would benefit from a free Thanksgiving dinner and called them to ask about their favorite foods and any stories or information that they would like to share with their residence hall. We also made "information slips" that the student donors could fill out, which would be given to the family they had bought food for. At the end of the drive, our group would personally deliver the Thanksgiving baskets to the homes of the families. If they preferred to remain anonymous, we would drop off the food at their church where they could pick it up. We managed to collect around 400 items in three weeks-- enough to provide a large dinner to eleven families and donate 75 pounds of leftover items to the State College Food Bank (which could feed four small families)! In addition, we also received enough monetary support from grocery stores to buy a turkey for each family and give gift cards to another two. Contacting, interviewing, and delivering the food to the families was an extremely eye-opening experience. Two of our group members had lived in State College for years, but even we hadn't realized how much need there was in this community; college campus activities and suburban sprawl tend to make a large portion of the population almost invisible. Several of our families were either homeless or lived in trailer parks or at a friend's house. Parents worried about their heating bills for the winter and whether they could afford Christmas presents for their children. And there were so many factors that contributed to their situation - costly medical bills, layoffs, a poor economy, and recent disasters (one family's apartment building burned down) - can easily and suddenly turn many people's lives upside down. We immediately knew that providing families with one Thanksgiving dinner will never solve the larger problems of poverty and lack of social support, but we hope that the new insight this project has given Penn State students, will. 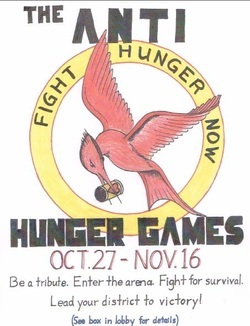 The Anti-Hunger Games is now in the process of becoming a club. I will be the treasurer and our advisor is Dean Gutgold, Associate Dean of the Schreyer Honors College. This summer we're planning to launch our website and begin preparing for the next Thanksgiving food drive.